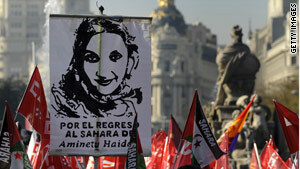 People hold Western Saharan flags and a poster of Aminatou Haidar during a demonstration on Dec 12. Madrid, Spain (CNN) -- An award-winning Western Sahara independence activist in the 32nd day of a hunger strike in Spain was expected to be returned soon to an airport where Morocco refused her entry last month, CNN partner station CNN+ reported late Thursday. The Spanish government sent a jet Thursday afternoon from Madrid to Spain's Canary Islands, where the activist, Aminatou Haidar, 43, had been on a hunger strike at Lanzarote Airport until the predawn hours Thursday, when she was rushed to a hospital. Haidar was suffering from abdominal pains and vomiting, according to her lawyer, Ines Miranda, who said Haidar was receiving treatment for the pain, but no food. The Spanish government jet is expected to take her to El Aaiun Airport in Western Sahara, CNN+ reported. Spain's prime minister and foreign minister have been directly involved in negotiations to bring an end to the diplomatic impasse between Spain and Morocco over her case, CNN+ reported. The terms of the probable deal were not immediately disclosed. Hours earlier Thursday, the European Parliament abruptly stopped short of voting on the Haidar case when lawmaker Martin Schulz of Germany told the parliament that it appeared "there would be a solution today." Haidar arrived at the airport on Lanzarote island -- just off Morocco's west coast -- on November 14, shortly after Moroccan authorities took her passport and refused her entry at El Aaiun Airport in Western Sahara. Haidar demands to return to Western Sahara, a former Spanish colony, without having to acknowledge Moroccan sovereignty over it. At a news conference last week, she said the Spanish government was holding her "illegally" at the airport and had "not done enough" to unblock the diplomatic impasse with Morocco over her case. "My demand is to return to Western Sahara, to hug my children and to live with them and my mother, but in dignity," Haidar said in a statement read by a supporter at the start of a news conference, which was nationally televised in Spain. Since the hunger strike began, Madrid has offered her Spanish citizenship or political asylum, but she declined. In an earlier statement e-mailed to reporters, Haidar thanked Spain but said, "I do not plan on requesting Spanish, American or Italian citizenship. I live under Moroccan occupation and I advocate, as do the rest of the Saharawi people, for our self-determination." But a senior Moroccan government official, Khalihenna Ould Errachid, told CNN partner station CNN+ in an interview that Haidar "has always been Moroccan." "She was never a part of the ex-Spanish Sahara," the Moroccan official added, "and I say that Aminatou Haidar should return to her Moroccan nationality and say it clearly, and tomorrow she can return, without problem,"
There had an open debate among Spanish officials about whether to force feed her if her physical condition further deteriorated. Haidar said last week she opposes forced feeding, adding that "no one can feed me against my will." Her lawyer threatened to take legal steps to block such a move. Until she went to the hospital early Thursday, Haidar had stayed in a small room in a building between the two main terminals at Lanzarote Airport, said a CNN+ reporter on the scene. She has been helped by numerous supporters, and left the room occasionally in a wheelchair to go to a restroom next door.